New Orleans Thus far President-elect Trump and his office have said nothing formally in commemoration of Martin Luther King Day. His Twitter-attack on civil rights warrior and Atlanta Congressman John Lewis capsulizes his own special oblivion to the struggles and aspirations of tens of millions who don’t live in Manhattan and winter in Florida. I was struck by the contrast as I recently read the obituary of Leslie Dunbar in my local newspaper when he passed away at nearly 96 years old. I didn’t know Leslie well, but I knew him from his time as executive director of the Field Foundation when I tried to raise money from him in the 1970s. During the time that Field operated the foundation was famous, especially under Dunbar’s direction as a funder of voting rights and civil rights efforts, particularly in the South. Several years after founding ACORN in 1970, as we made our first ventures to New York in 1974 to try and raise foundation money, Leslie and Field were on the short list as “naturals” to support a growing community organization with roots in Arkansas. My first visit didn’t go well and in a follow-up letter when I described ACORN’s mission as trying to build an AFL-CIO of membership-based community organizations of low and moderate income families, he dismissed the whole effort somewhat brusquely with a hand scribbled note saying that, “the last thing we need in this country is another AFL-CIO.” That stung, even though decades later, I can concede the point as the AFL-CIO becomes more and more sclerotic, and eventually Field became one of our consistent funders until it closed its doors. After Hurricane Katrina a decade ago, it was great to talk with Leslie and his son, Tony, when he visited New Orleans before moving to the city in the last years of his life. His obituary spoke to the transformational power of the civil rights movement though and the clarity of its call to men and women who cared about people and equal rights and justice for all. It turned out Leslie had a PhD in political philosophy and constitutional law from Cornell and had bounced around on the track between academia and government service until ending up running the political science department at Mount Holyoke when in 1958 he jumped into the fray. Remember that the Montgomery Bus Boycott which propelled Martin Luther King, Jr. into national prominence ran from early December 1955 until about the same time 1956. The power of this emerging civil rights movement was life changing for millions, and Leslie Dunbar was clearly one of the many who ached for a way to align their convictions with their actions or move in Trump’s sense from all talk to as close to all action as they might get. 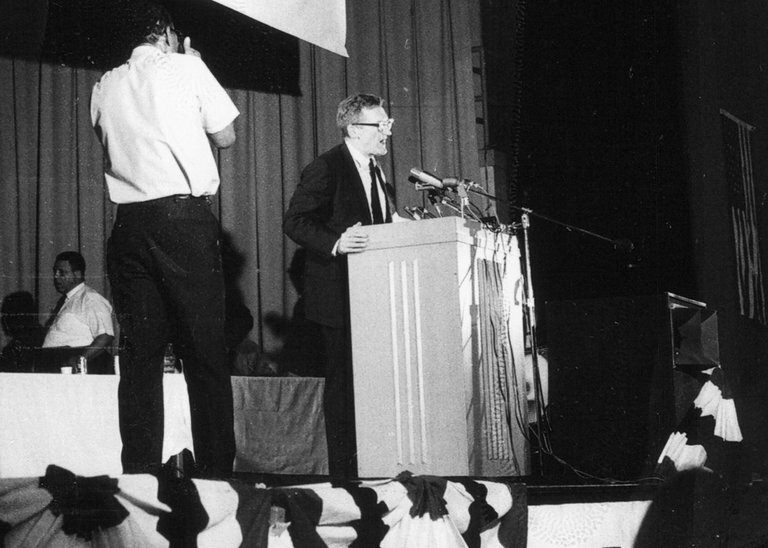 In Dunbar’s case he moved to the Southern Regional Council, which was a mainstay of research and advocacy around race and voting rights at the time and for many years thereafter. When I’m in Little Rock I still take note on most visits of the plaque that remains in our building’s meeting room when ACORN was named by the SRC as the outstanding organization in the South in 1973. Leslie’s obit notes with some pride his role at the SRC along with King at the Southern Christian Leadership Conference and the NAACP’s Roy Wilkins in establishing the Voter Education Project, and the 2 million people it helped register. In these early years of ACORN we were proud to work with VEP during the years that John Lewis ran the project from 1970 to 1977. As organizations ran from voter registration and the modern attacks on voting rights that have accelerated in the 21st Century, there is no organization that began in the South as ACORN did in Arkansas in 1970 that didn’t understand that every peoples’ organization had a commitment forever to expand and protect voting rights, regardless of the consequences, if was to be accountable to his membership and their aspirations. 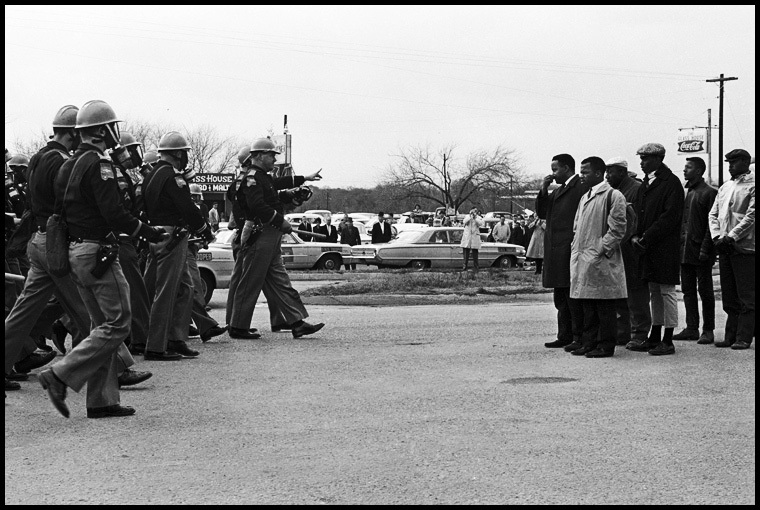 In the sense that John Lewis today is a headline example of such lifetime commitments, Leslie Dunbar and tens of thousands like him, playing roles large and small, uprooted their lives and sometimes gave their lives, as King did, at the call and in service to doing whatever they could and whatever they were able in order to build a movement to change America. We watch the first African-America president leave office in the legacy of that movement at the same time we watch a new president move to office while trying to ignore and perhaps destroy that movement. He has to be taught once again that we shall not be moved. New Orleans Too often our tactics lose their edge when they devolve into more show than steel, more parade than march, more about the media than the target. This is constantly an organizer’s dilemma in putting together actions that have to impact various audiences. Without care and thorough, disciplined organizing with real people actions can become mere charades and performances rather than demonstrations of power producing pressure and change. If, as the saying goes, pictures can say a thousand words, I could hear more than that while looking closely at two reprints of photos taken by James “Spider” Martin, the Alabama newspaper photographer of the events around Selma and Montgomery in 1965 that the New York Times reprinted from his archive recently acquired by the Briscoe Center at the University of Texas at Austin. There were details in the picture that were the signatures of authenticity, keeping it real. In the 21st century backpacks are everywhere weighing down school children and slung on the shoulder behind a hoodie defining urban transportation and community for many. Backpacks were for campers fifty years ago, the badge of Boy Scouts and few others. 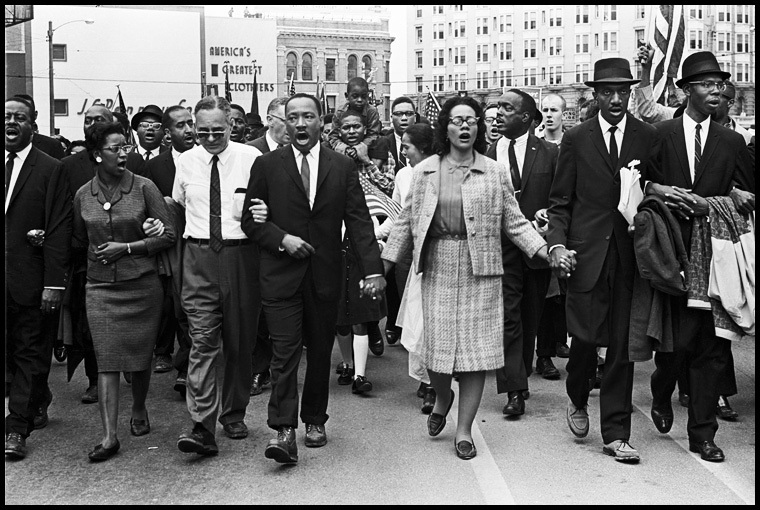 It struck me watching the film, Selma, recently and again studying the picture of John Lewis and Hosea Williams in the faceoff on the Pettus Bridge before the police attack, that Lewis was wearing a backpack over his overcoat. That backpack is itself a symbol of seriousness. What did he have in that pack? Was he prepared to cross the bridge towards Montgomery? Was he hoping he had access to a toothbrush or a change of shorts if he ended up in jail? It doesn’t matter for the point of the march. The backpack makes it real and yells to anyone looking – and caring – that he was ready. The coat, tie, and even the overcoat were a message to the media and the American people that the marchers were good, solid, reasonable people trying to make change and not fire-breathers or as George McGovern said while running for President, “…those who would be most radical must appear the most conservative.” The backpack though makes it all real and not just a show. Another picture of the march hitting the streets of Montgomery several weeks later could be any picture of any march anywhere, except for a similar and significant difference. If you looked down from the photo of the front line singing, Martin Luther King holding Coretta Scott King’s hand, and their triumphant entry into the city, you see that on King’s feet and a couple of people over on Rev. Ralph Abernathy’s feet are hiking boots. King has his suit pants cuffed over the boots, while Abernathy has his hanging loose. Those boots make it all real. This was no parade. This was a march on the capitol. This was real; they had done the miles; they had taken the steps along the highway. 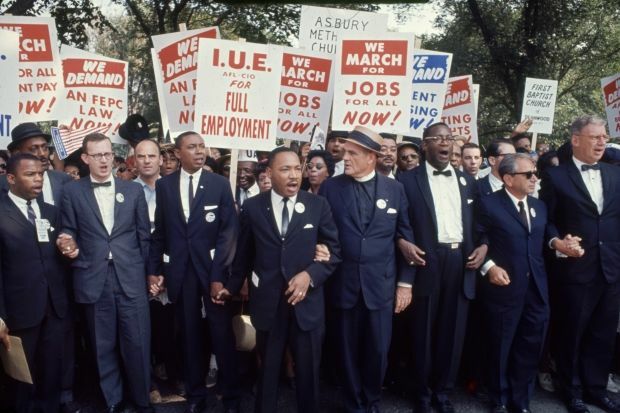 The suit coats, slacks, white shirts, and ties were put on for the camera and many in this same picture had undoubtedly joined at the end for the final surge, but the hiking boots on the front line on King and Abernathy’s feet and another pair of hush puppy looking shoes mismatched to another front line marcher’s shoes tell the true story of real struggle. There’s more than the devil in the details. There are the touches of reality that bring the punch and power to action, and worth every organizer remembering.